If you’re looking for a hearty winter dinner, this recipe is it! 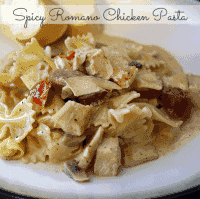 Spicy romano chicken pasta – full of pasta and mediterranean flavors! I’ve been participating all week in the SITS Girls Blogtober Challenge. Monday, we linked up our About Me pages. 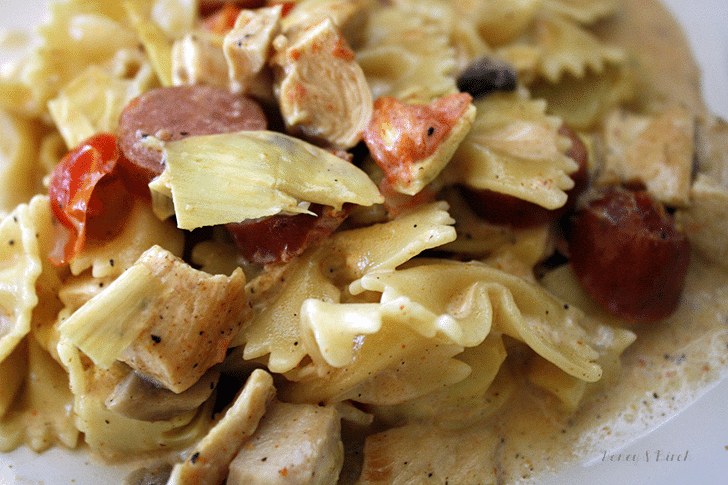 Tuesday was Twick-or-Tweet Tuesday, and we shared our Twitter profiles. Wednesday, yesterday, we shared our Pinterest profiles for “Blogtober Gets Pinteresting”. Yesterday, I was supposed to share or write a post about past Halloween’s on the blog. And as I was looking for pictures from previous Halloweens I realized I could only find pictures from 1 Halloween about 6 years ago. I also realized that I don’t really celebrate Halloween anymore and I honestly don’t enjoy Halloween that much. Maybe when I have kids it’ll be different. I sure liked it when I was a kid. My mom went all out and sewed my brother, sister and I the most elaborate costumes. My favorites were the Elizabethan princess costume where she hand sewed all these pearls and beads all over my satin dress, and this crazy witch costume with long flowy sleeves. She ratted my hair up and used two cans of black hair spray – I looked like I was wearing a wig but it was all my own hair. I even won a costume contest that year (I think I was 12) for scariest costume. My mom rocked and I hope when I have a baby I can be as awesome as her. Because there is no way I’m getting in a costume now. I decorated our home for fall, but there’s not a single Halloween decoration up. I don’t even plan on being home for the trick-or-treaters. A coworker asked me if I’m gonna dress up this year, and I laughed. I’m declaring myself the Halloween Grinch. Am I the only one who can’t get in the Halloween mood? Is it because I’m a childless adult? I know I have gotten really sick of the bar scene, so that might be part of it. If you don’t have kids, as an adult your only option is a crazy bar party and I don’t really feel like that’s my scene. November 1st can’t get here soon enough. To get my mind off of Halloween, I did a little playing around on the computer. I discovered an awesome way to edit multiple photos at once using Photoshop Elements and let me tell you, what a timesaver for blogging. I truly think that it was taking me about an hour and half to two hours for each post just editing pictures alone. Pretty much, go to File and then Process Multiple Files. The rest is self-explanatory if you edit photos the same way I do (resizing, renaming, sharpen just a little, and watermark.) I think I just saved myself a few days worth of work in total, and I may actually be able to post more. We will see. If you take a lot of photos for any reason at all, this would be a great thing for you to use. You could rename all of your photos so its easier to find them with the click of your finger. 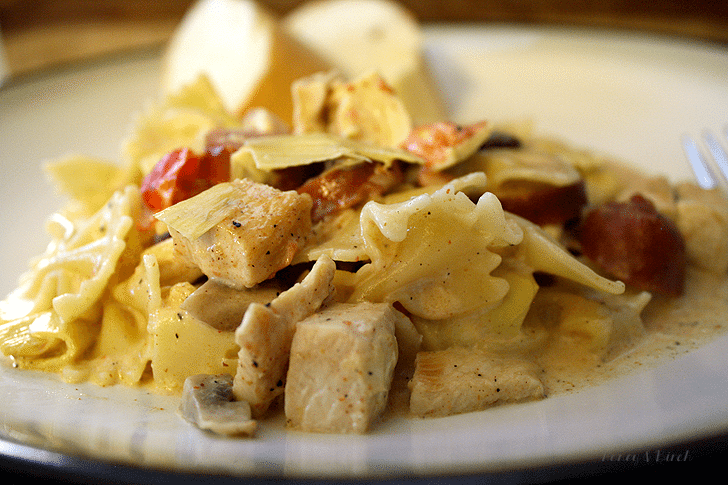 Something to consider……..
And now, if you’re hungry, here’s the recipe for the delicious photos I’ve been teasing you with throughout this whole post. 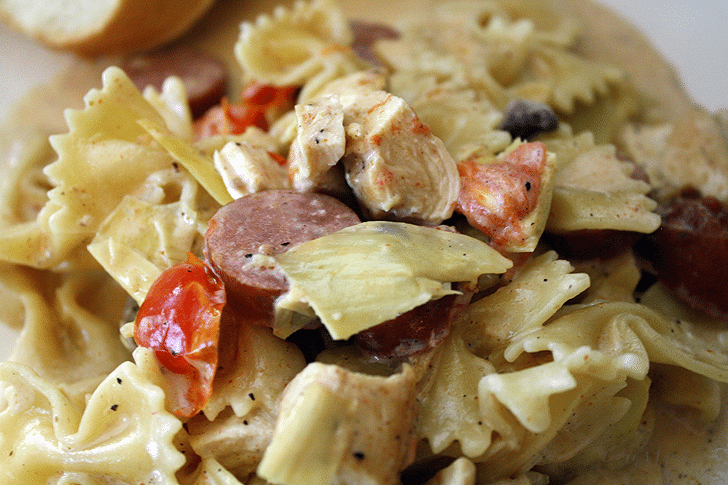 This recipe feeds a lot of people – cook less pasta if you don’t want a ton of leftovers. 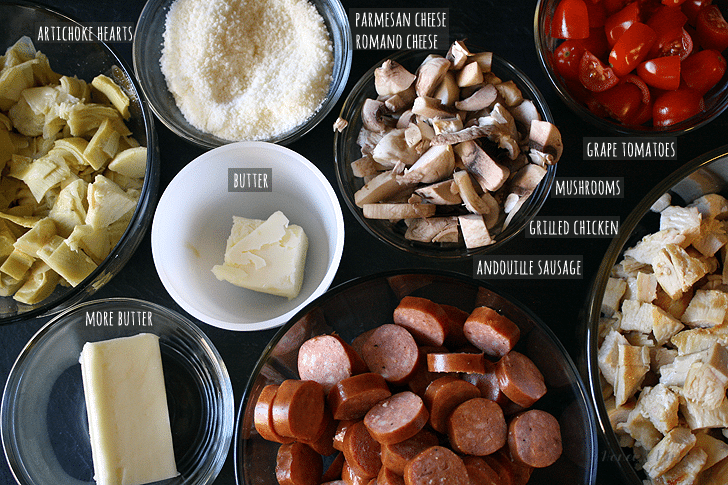 There’s plenty of sauce if you wanted to cook more pasta to feed more people too. 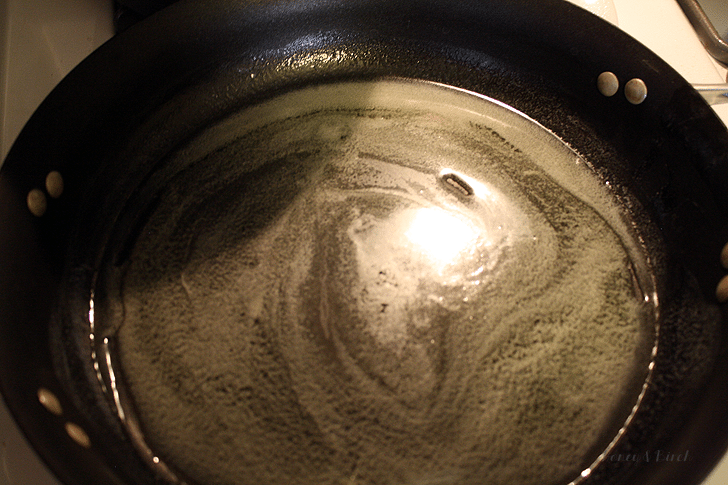 Melt 4 tablespoons butter in a saute pan. 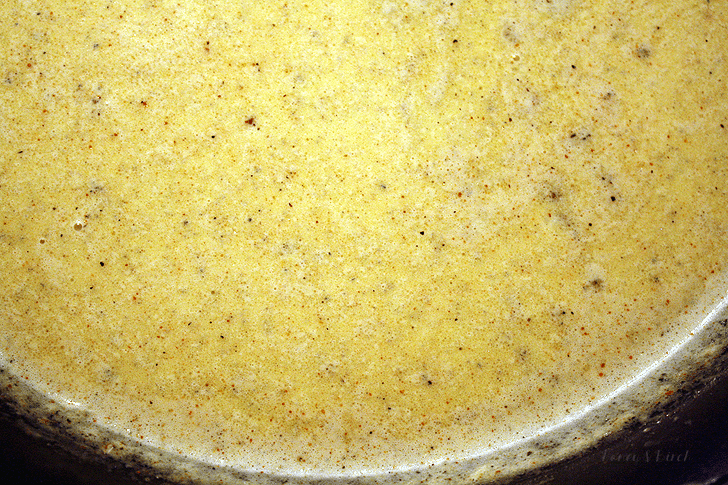 Add 2 cups of heavy cream, salt and pepper and heat to a boil. 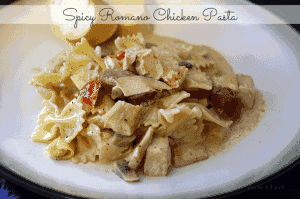 Remove from heat and fold in the Romano cheese, Parmesan cheese and cayenne pepper. 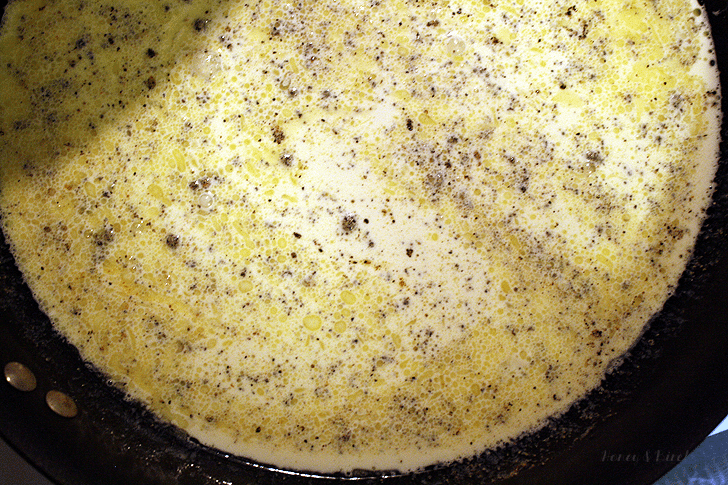 In a very large skillet (the largest you have), melt the remaining butter. 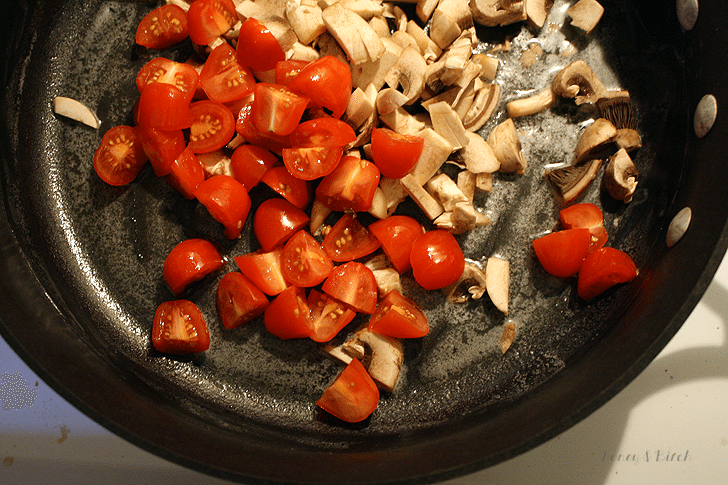 Add the mushrooms and grape tomatoes and saute for one minute. 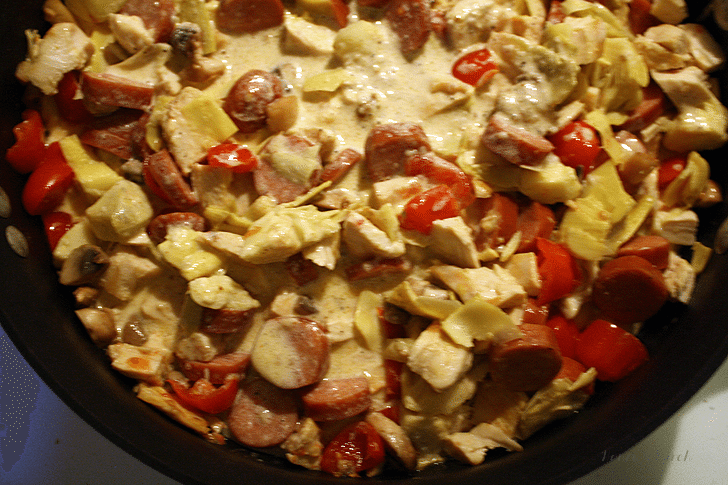 Next add the artichoke hearts, chicken and sausage and stir. 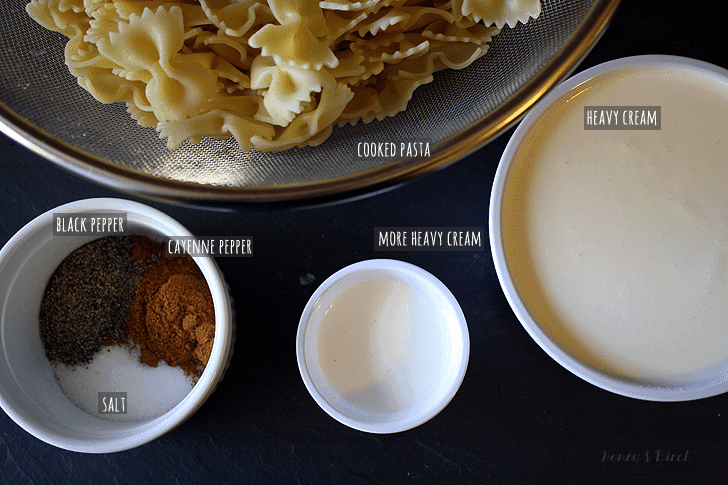 Add the remaining heavy cream and half of the sauce. 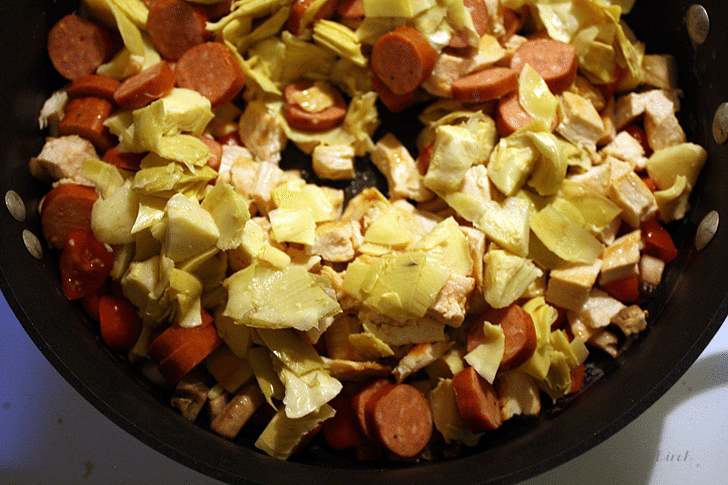 Add the pasta and the remaining sauce and stir well. 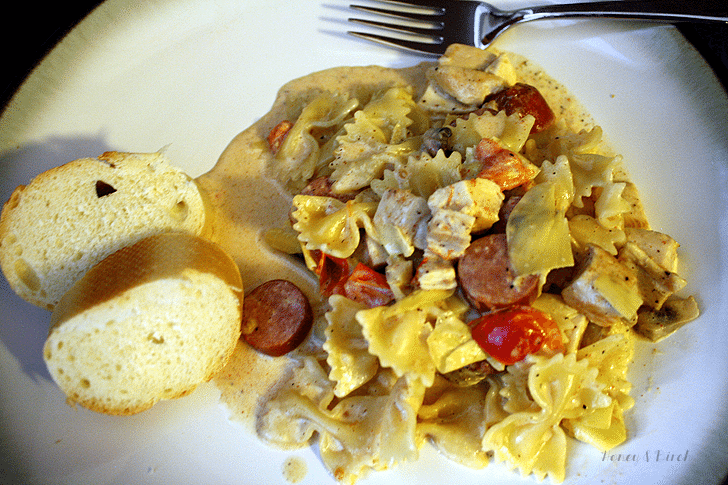 Serve with crusty bread and a salad.